Western blot analysis of extracts from NIH/3T3 cells, untreated or treated with PDGF, wortmannin, LY294002, rapamycin or PD98059, using Phospho-Akt (Ser473) Antibody. Western blot analysis of extracts from NIH/3T3 cells, untreated or treated with PDGF for the indicated times, using Phospho-Akt (Ser473) Antibody (upper) or Akt Antibody #9272 (lower). 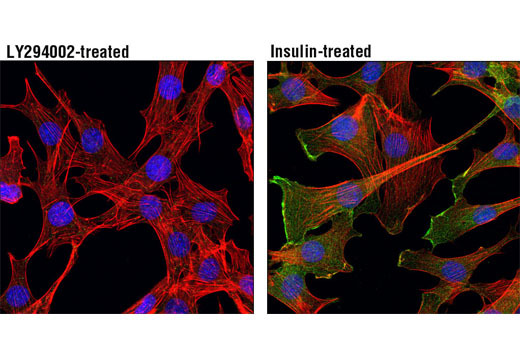 Confocal immunofluorescent analysis of C2C12 cells, treated with LY294002 #9901 (50 uM, 2 hrs; left) or insulin-treated (100 ng/mL, 30 min; right), using Phospho-Akt (Ser473) Antibody (green). Actin filaments were labeled with DY-554 phalloidin (red). Blue pseudocolor = DRAQ5® #4084 (fluorescent DNA dye). 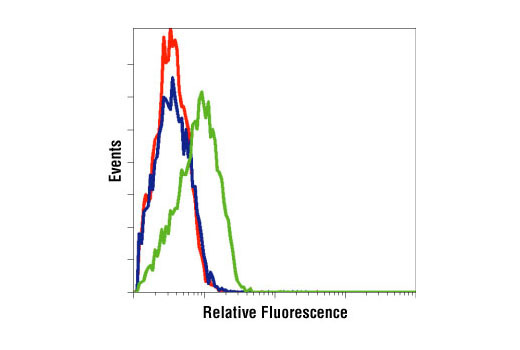 Flow cytometric analysis of LNCaP cells, untreated (green) or LY294002-treated (blue), using Phospho-Akt (Ser473) Antibody compared to a nonspecific negative control antibody (red). 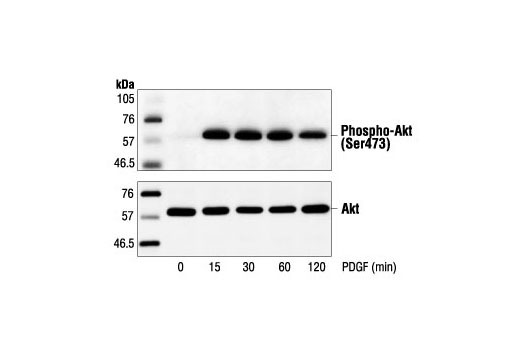 Phospho-Akt (Ser473) Antibody detects endogenous levels of Akt1 only when phosphorylated at Ser473. 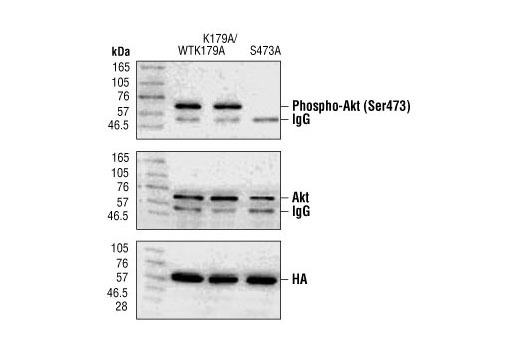 This antibody also recognizes Akt2 and Akt3 when phosphorylated at the corresponding residues. It does not recognize Akt phosphorylated at other sites, nor does it recognize phosphorylated forms of related kinases such as PKC or p70 S6 kinase. 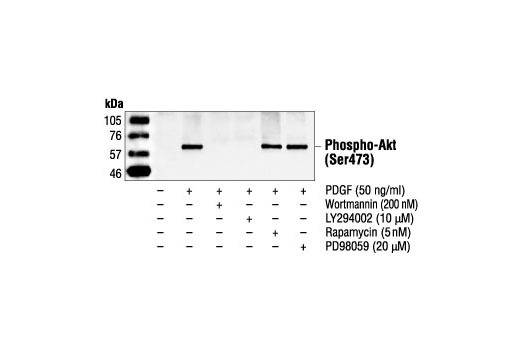 Polyclonal antibodies are produced by immunizing animals with a synthetic phosphopeptide corresponding to residues surrounding Ser473 of mouse Akt. Antibodies are purified by protein A and peptide affinity chromatography.